Storm-ravaged Puerto Rico has promised a full audit of a $300m (£227m) deal won by a small electrical firm with Trump administration connections. A US House of Representatives committee is also scrutinising the contract. The chief executive of Whitefish Energy Holdings in Montana knows US Interior Secretary Ryan Zinke, while one of its investors has donated to Donald Trump. 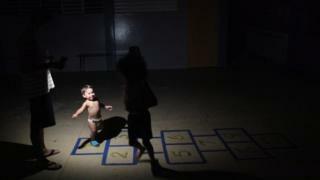 More than 80% of Puerto Ricans remain without power more than a month after Hurricane Maria struck. Governor Ricardo Rossello's announcement came late on Tuesday as questions mounted about the deal with Whitefish Energy Holdings, a two-year-old company that has seemingly little experience with work on this scale. The contract, inked by Puerto Rico Electric Power Authority (Prepa) in the immediate aftermath of the storm, will be paid for by the US Federal Emergency Management Agency (Fema), Puerto Rican authorities have said. A Fema spokeswoman said their organisation "had no involvement" in the deal-making process between Whitefish and Prepa. "Fema has received the project from Prepa and it is under review to ensure it is in compliance with established procurement guidelines," she said. Congressman Darren Soto, a Florida Democrat of Puerto Rican descent, told the BBC he will be requesting an investigation from the Department of the Interior's Inspector General. "It is concerning that the task of rebuilding Puerto Rico's energy grid - the biggest infrastructural rebuilt in the United States since Hurricane Katrina - is being contracted solely with Whitefish Energy," he said in an email. The House Natural Resources Committee is scrutinising the agreement. "The size and unknown details of this contract raises numerous questions," committee spokesman Parish Braden told the BBC on Tuesday. "This is one of many things the committee is taking a close look at as it continues to work with the resident commissioner, governor's office, and oversight board to ensure Puerto Rico's recovery is robust, effective and sustained." Puerto Rico, a US territory whose 3.4 million residents are US citizens, was struck by two hurricanes in September - Irma and, later, the more-destructive Maria. The second storm all but wiped out the island's power grid. In a Facebook post dated 29 September, Whitefish Energy Holdings announced that it had "received a contract from Puerto Rico Power Authority (Prepa), to rebuild the hurricane ravaged power line infrastructure". On 19 October, the company announced that Prepa had formally approved and ratified its agreement. Whitefish Energy Holdings said it had been working for Prepa since 26 September, six days after the storm made landfall, "to repair and reconstruct electrical transmission infrastructure on the island". Little is known about the utility company. On its website, the company says it was created in 2015 is and funded by two Texas investment firms and a Brazilian transformer manufacturer. It states that it is headquartered in Whitefish, Montana, which also happens to be the hometown of Mr Zinke, the US interior secretary. In an email to BBC News, the US Department of the Interior said: "Neither the Secretary nor anyone in his office have taken any meetings or action on behalf of this company and played no role in anything to do with any contracts." However, Mr Zinke does know Whitefish chief executive Andy Techmanski because "they both live in a small town (population 6,000) where everyone knows everyone", said the statement. While it has provided regular updates on its work in Puerto Rico since its announcement on 29 September, there appears to be no posts on its Facebook page before the date of the contract announcement. An industry trade group says it "understands that Whitefish has previously worked on the island and is familiar with Prepa's facilities". A search on GovTribe, a site that collects information on government contracts, shows that Whitefish was awarded a $1.3m contract in July for work in Arizona. The US Federal Emergency Management Agency (Fema) placed the US Army Corps of Engineers (USACE) in charge of "the immediate power restoration effort". When asked by BBC News about the contract, USACE spokeswoman Catalina Carrasco said on Monday "the US Army Corps of Engineers does not have any involvement with the contract between the Puerto Rico Electric Power Authority and Whitefish". She referred further questions to Prepa. Multiple emails sent by the BBC to Prepa on Monday and Tuesday were not returned. In his statement announcing an audit of the deal, Governor Rossello explained how the island's authorities came to work with Whitefish after the passing of the first, less-destructive hurricane. He did not explain how the relationship with Whitefish changed in the run up to nor immediate aftermath of the second, stronger storm. His office tweeted on Tuesday that "the [power authority's] investment to repair the electrical system will be refundable by @fema". Whether Fema reviewed the deal struck between the two companies before it was signed remains unclear. Meanwhile, questions have been raised about whether political donations made to President Donald Trump's campaign and allied groups could have influenced the decision. A review of federal election data showed that a founding partner in HBC Investments, one of the two Texas firms that backs Whitefish Energy Holdings - had donated $2,700 to Mr Trump's presidential campaign, as well as $20,000 to a group that supported the White House bid. According to election data, the investor also gave $30,700 to the Republican National Committee in 2016 - after Mr Trump became the party's presumptive nominee. A message sent to the investment firm was not immediately returned. Members of the US business community frequently donate to political parties, and many tend to favour Republicans. Also of interest to those scrutinising the deal was the decision by Puerto Rico not to request a programme known as "mutual aid". Co-ordinated by the American Public Power Association (Appa), this scheme arranges for other utilities to offer assistance. "When (and even before) a major disaster hits a utility's territory and the utility knows that its own crews and equipment won't be enough to restore power quickly, it calls for mutual aid," the Appa states in a document on its website. By way of comparison, the US Virgin Islands - also damaged by the hurricane and geographically close to Puerto Rico - have requested such aid, according to the Appa. Brandon Smulyan, a representative for Whitefish, told BBC News in an email that the firm had been talking to Prepa before Hurricane Maria struck the island. "They knew the company's experience in mountainous regions because they discussed the work previously," the spokesman said, adding that Whitefish specialised in "working in rugged, remote and rural terrain". Mr Smulyan said that Mr Techmanski and Secretary Zinke had "no business relationship", and that Whitefish had not advised Puerto Rican authorities to avoid seeking mutual aid from other utility companies. About 18% of customers have electricity as of Tuesday, according to the Pentagon. The Puerto Rican governor's goal is to have 30% restored by 30 October, 50% by 15 November and 95% a month later. Our #WhitefishEnergy team is proud to look up and see the progress we've made for #PuertoRico. More and more to come!